Learning from the errors made with the actual layout, I have come up with this much improved layout. The basic trackplan is more or less the same, but space is much better used, and thanks to just a few changes the possiblities are much bigger with this one. The room is of course the same; 5 x 3 meters. Instead of the 100 meters of rail I have now, this layout has almost the double! First off is the shadow-station. This time with 2 tracks in the automatic block-sequence (3 meters useful), and 8 tracks for storing trains. Each track can hold trains of at least 2.50 meters. The whole station is thought build directly on the floor, with a 6 or 7 rounds helix up to the main layout. The shadow station should be covered partly by transparent plexi-glass for spectaclurar view and easy control. To make the station with curved track is necessary for me to use as much as possible of the old M-tracks that I have, because I dont want to have any visible M-track anywhere. 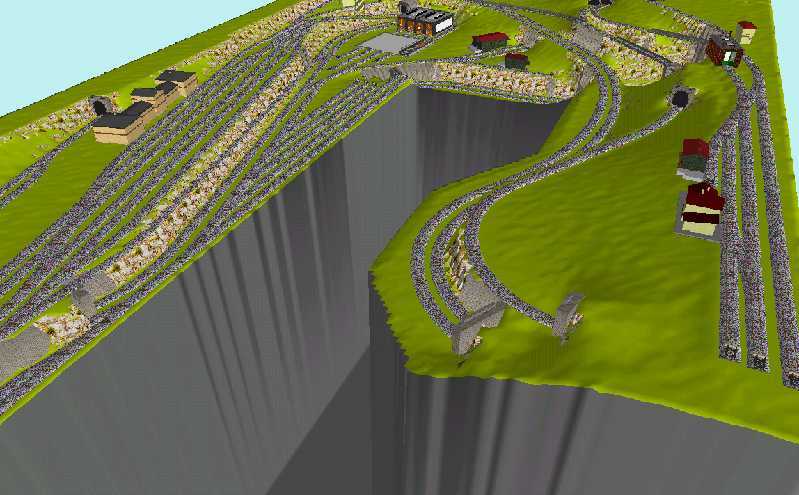 Here we see the main part of the layout. Arriving after climing the helix, the train crosses the whole layout on a soft curved track. Entering another tunnel and entering the main station from the west side. The west exit of the stationdisappears in a tunnel, and the train again briefly appears going to the smaller shadow-station some 20cm under the main station. Showing here is the branching off mountain-line which this time can be used as a separate oval, and has its own small shadow-station. The idea with this is to have two trains going round in circles on this oval, while the push-pull trains crosses them in the shadow-station, between the main station and the mountain station. Also shown is the shifting yeard, engine maintenance area and some industry tracks. This area is connected to the main-line/central via a descending through-track for east bound trains, and via reverse loop kind of helix for west bound trains. Also there is an exit to the main line (inside a tunnel) for trains going east. The above picture shows the two visible stations. One detail is the through-tracks of the main station. I dont want to see freight-trains near the passenger platforms anymore. Now the freight-trains will automatically select a track without platform. The east-going track is a descend connecting the maintenance- and shifting-yard with to main line. The small mountain station; This is now placed as far away as possible from the inclined wall/roof, to allow for more height and better moutains. The "gesamtansicht" showing the whole layout (only the ground-level shadow station has been removed). Also seen here is a small tram, with a stop just outside of the main station. Stay tuned for publication of plans for the new layout in our new house. 9 x 4 meters of space with no inclining roof!